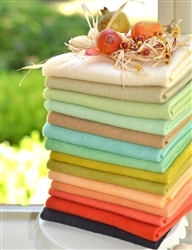 Bundle includes Fat 1/8 yd. cuts [app. 13" x 15"] of 14 wonderful wools starting with Kohl black and working our way up to the creamiest of creams!